Milk Toffee is extremely simple, easy & quick to make. It requires few ingredients which are easily available in your kitchen as well as in the supermarkets or grocery shops. This toffee is delicious & is loved by all. 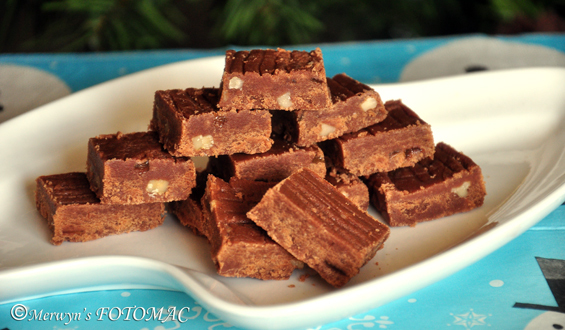 Milk Toffee is good to serve on your festive platter of Christmas goodies. Not to forget, they do make excellent gifts! Wishing you all A Merry Christmas & A Happy New Year 2013. First, sift together milk powder & cocoa powder. Set aside. In a non-stick pan, dissolve sugar in water & allow it to boil on med. flame for about 10 mins. Keep stirring till it reaches a one thread consistency. To test, drop few drops of the sugar syrup in a bowl of water. It should settle down at the bottom like strings & not dissolve in it. Be alert! The syrup will quickly change its consistency after reaching the string consistency & starts crystallizing. Reduce to low flame & add butter. Stir to incorporate butter completely. Add the reserved milk-cocoa powder mixture a little at a time & stir while doing this to avoid lumps. Mix & combine thoroughly. Add the chopped dry fruits & mix well to form a nice thick paste. Cook till the mixture starts leaving the sides. Switch off the flame & beat the mixture with a spoon for about a minute or till the mixture thickens slightly. Pour in a greased tray & quickly spread to level it. Cool completely. Cut into desired shapes using a sharp knife or pizza cutter. You may even use decorative cookie cutters if you like. Enjoy at Christmas or whenever you feel like eating it! I would love to make this! Thanks my dear Hilda for the recipe.